Greetings from Walkera UCDrone.com, this month we will officially release the Walkera Rodeo 110 Racing Drone and we are seeking out reviewers. For those who do not know, UC Drone is Walkera's USA Center for Drones, with office and warehouse located in Seattle Washington, USA. We are the Walkera North America management team bringing you some new exciting products in 2017 in different ways. Walkera Rodeo 110, anticipated as one of the best racing drone for indoor and park racing released to date, a mixed blend of strong structure and yet small form factor. Compared to it's sibling F210, the Rodeo 110 is relatively small with a wheelbase of only 110mm, net weight (not including the battery) is less than 100g, making it agile and fast. Here you can discuss, innovate, rave, feedback and share your Rodeo 110 experience. In addition, if you have an interest, if you want to receive one, anywhere in the world, please comment below your review experiences . We look for folks that can provide constructive feedback in video, good humor and write-ups (like what we all like.. real people, at your real hometown setting, raw fun). 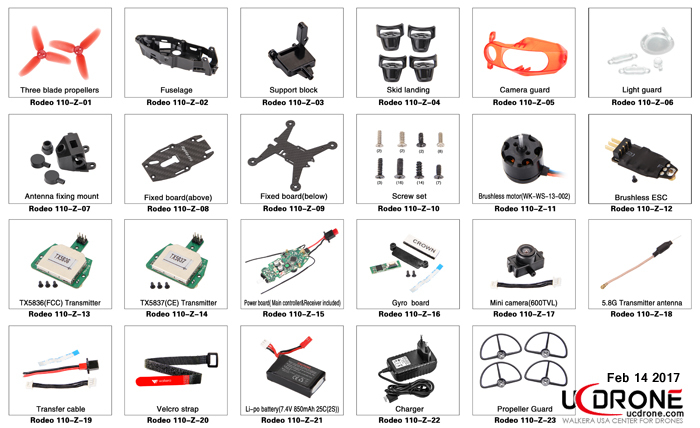 When selected, we will send you a link to place your free order at ucdrone.com. (Now CLOSED, but please look forward to the next model announcement by following Me or bookmark this !). Living Blog. Be back shortly. ** SUBSCRIBE see our past fun videos here **. Last edited by UAS; Mar 24, 2018 at 07:41 PM. Since the release of Cleanflight 2.0+ and Airmode, you will notice pilots have to install a local copy of Cleanflight version 1+ to regain access to the configurator. This is a standard practice for Cleanflight users, not limited to Walkera FC, a thing early adopters of Cleanflight have to do. There are various tutorial available online showing you how to load a local copy in Chrome. This also explains why a local copy of the configuator is included with the firmware, which you can also choose to use if you prefer not to download one from github. Some countries may not have access to github, so a second reason to include the cleanflight configurator. Last edited by UAS; Jun 07, 2017 at 10:30 PM. Last edited by UAS; Feb 06, 2018 at 06:31 PM. I would definitely be interested in reviewing this drone. I would love to review this quad and give constructive feedback in video and write-up. I have been flying RC for 25 years and built my first quadcopter 4 years ago. I now have 10 quadcopter 12 helicopters 4 planes. noted, thanks. will get more details of your experience or creative cloud later. cheers! Hi, I live on the beautiful island of Maui, Hawaii. I can showcase the rodeo 110 in an amazing setting. I fly fpv daily and use a Walkera Devo7e transmitter and love Walkera products.Can't wait to try the Walkera Rodeo 110. Thanks! YouTube user name happyvalley808, new youtube channel diyhackstuff. Last edited by noone7; Dec 12, 2016 at 04:34 PM. Please scroll down a little on the blog page, and click the "Find all Threads started by SoloProFan" link (on the right), for a complete overview. I have built a handful of quads since I have started this hobby in February. I am studying mechanical engineering, so I would like to say I have a good understand of the fundamentals of quads since starting. Check out my instagram where I show most of my quad related stuff :->username: redbeardddd. I would love to review your product and see what the Rodeo 110 can handle! I actually planned on designing my own micro sized quadcopter about 110 sized so this could be perfect to see what these brushless micro quads can do!! I would be really excited too see how it uses AA batteries, check out these flight times of 6-7 minutes, and compare you varying vtx to the ones thatre out there currently. Lastly, I am curious about the durability but I guess I will have to wait and see first! I'd love to review this. I've done other reviews on which you can see on my blog page here. I am a fairly new drone pilot having flown only sub-$100,drones. My goal next year is to start flying fpv and start a blog about my adventures. I live in a rural area and have wide open and wooded areas in which I currently fly. If you feel a beginners perspective and review would useful, please contact me via PM. Last edited by mrwagdog; Dec 12, 2016 at 11:32 AM. i live out in the country right here in the beautiful California valley i would love to review your product thank you for your consideration. I would love to review it! I have done reviews for a couple companies, and have sold lots of money for all those companies. For example, I have sold over $3000 for gearbest in the last 3 months. I have reviewed everything from tinywhoops up to 5inch racers. Just curious, how much do you sell money for? Seriously though, I'll know to keep your user name in mind so that I can ignore your reviews. I want to see and read unbiased reviews, not reviews from people that will say anything possible positive about a product so that they can get more free stuff.